I know, it’s a most cringe worthy title, but I could not resist. Social media, Facebook in particular, is visually impactful; the image of an employee apparently licking an entire stack of hard shell tacos inside of the restaurant immediately was too irresistible, too share-able. We have been through this before, with Burger King, Dominoes, and even Taco Bell a couple of times. In 2011 the company responded to an attack and lawsuit accusing them of not using real beef by countering on social media. An employee decides that it would be funny or vengeful, or whatever the inexplicable reasoning they use to post an image that horrifies their patrons. The web lights up with the image, and social marketers sit waiting to pounce on the first misstep by the attacked restaurant chain. Silence: we’ve all witnessed the shutting down of comments and a total radio silence. Delayed Reaction: My partner Danny Brown will tell you that no company should be expected to respond within minutes. I may disagree with him on the speediness required, but I do think that we, the social mob, have unrealistic expectations of the response time required. A non apology, apology. No need for explanation, but it’s the ‘we’re sorry if you’re offended’ sort of response that we have all shaken our heads at countless times. Very often, the person who is to blame, the dolt who created the imagery, is forgotten about and the company becomes the bad guy. Was the Taco Licking a Crime or a Prank? While Taco Bell was undergoing every CMO’s worst social nightmare, I had a busy week. My normally mediocre patience was even shorter than usual, and when I read this story I wanted to personally bend the perpetrator ‘kid’ over my knee. I was totally fed up with these stories of fast food restaurant employees endangering the health of unknowing customers AND harming the reputation of their employer, and I took my little rant to Facebook. Two of my respected, social savvy friends suggested that I lighten up, that this was just a ‘prank,’ and that we’d all done silly things when we were young. Another friend suggested that this continued to happen at fast food restaurants because the employees were all underpaid and disgruntled. One reasoned that this probably came from the ‘top down,’ as in from the management of that one particular restaurant, so the employee wasn’t fully to blame. Lastly, and most wisely, I was cautioned that, at the time of my rant, we did not have all of the facts. We didn’t know what had actually taken place – perhaps those shells were being thrown out and the employee and his photographer were just having a little fun. Yes, we all did silly things when we were young and immature, I get that. However, I think that we all understood, or SHOULD understand, that there are consequences to our actions. If we get caught doing something stupid, we should expect a punishment. The real question is: what is that punishment? If you don’t like your pay, you don’t have the right to take it out on innocent customer and your fellow employees, because if the company WAS impacted by your idiocy, do you think the upper management would be the ones losing their jobs? I think that attitude and disrespect usually trickle down, so it is likely that management at this particular restaurant needs a tune up. I don’t know the circumstances of this specific employee and his manager, but anyone who has worked in the restaurant business knows that they’re not all created equally. Those who value respect and take pride in their business and in serving their customers usually have employees who embrace their values. I think we’d all be beyond shocked if this happened at Starbucks for that very reason. I can’t disagree with the need for fact finding; it was true that at the time of the licking going viral, and my ensuing rant, we had no idea about who/when/if the incident actually occurred. More patience and a holding of the tongue was indeed appropriate. So this employee has lost his job – is that enough? Not in my ‘fed up to here with the idiocy’ opinion. I do not think that jail time is in order, but I am still a big believer in the type of public shaming that comes with community service punishments. If this kid was not embarrassed by the image that was posted online already, do we really think it will break him to wear a bright orange jumpsuit and clean up trash along the road way? The ‘prankster,’ potentially risked the health of customers, and he risked the reputation of a business. Why should there be no punishment for that? There has to be a better deterrent than losing a job you obviously don’t value. Right now the only consequence appears to be a firing and fleeting viral fame. Not good enough, in my opinion. I’m sure some of you will disagree. How did Taco Bell react? On June 3rd, Taco Bell posted the following statement on their website, on a page you had to actively look for under “Company,” not on the home page. What Did the Social Experts Think Taco Bell Should Have Done? Like Taco Bell, we’re all getting a little more experienced at these employee-created food crises, so I think the collective reaction was relatively measured. 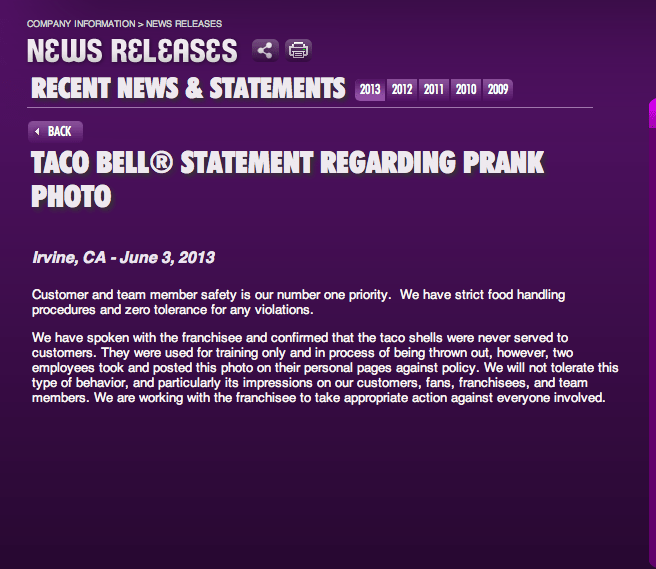 There was a lot of blogging about the incident, but not too much condemnation for the victim, Taco Bell. Melissa Agnes, who specializes in Social PR Crises, certainly didn’t think Taco Bell did a good job, and she used her blog to scold the company sternly. I do think Melissa makes some good points, and her tools to measure what is a social crisis are valid. Here are her questions to determine if an issue is a crisis; she answers for Taco Bell. In her post, Agnes takes them to task on their handling in general; I don’t necessarily agree with her. Agnes is right, it was great that Taco Bell swiftly put out a statement, but burying it on an unseen website page instead of blasting it all over Social Media may have been a mistake. If indeed they did shut down comments on their Facebook Page (honestly, I wasn’t sitting watching their every move as the crises came to life), that is something I would never recommend. Nor would I recommend they answer every single troll who attacks them on any of their networks. In the Agnes post, the author states that Taco Bell closed off their Facebook Page, and as I said, I wasn’t there for the play by play. However, I did spend the better part of an hour scrolling back through all of the posts by others on the Taco Bell Facebook page last week; there were MANY posts containing the picture, and Taco Bell answered every single one of them and shared a link to their statement. On their current Facebook Page Taco Bell appears to engage regularly with their commenters. Their followers seem to be passionate about Taco Bell, and many of them have a wry sense of humor. When there is a complaint about customer service Taco Bell asks for more details and provides both a link AND a phone number for the customer to speak in more detail to the customer. I give them a high score for that. Another thing to note, Taco Bell did NOT stop people from continually posting the lick shot. It appears over and over again, usually with fairly polite questions, and each time Taco Bell answered. Their twitter feed right now is devoid of conversation about ‘The Picture,’ and as I’ve stated a couple of times , I was not monitoring the situation real time. There were lots of social bloggers out there full of advice for Taco Bell. The best suggestion I came across came from the comment section on Branding Magazine’s short post. Personally, I think that Taco Bell should not make a Big Noise, but make the right noises. Use this as an opportunity to subtly reaffirm whatever commitments to training/hygiene they have, fire the employee quietly or retrain him then use him as an ambassador of sorts. A statement of apology isn’t enough. Anyone can write words. What is more socially meaningful is the right action communicated well and with humility. How Does It End for Taco Bell? 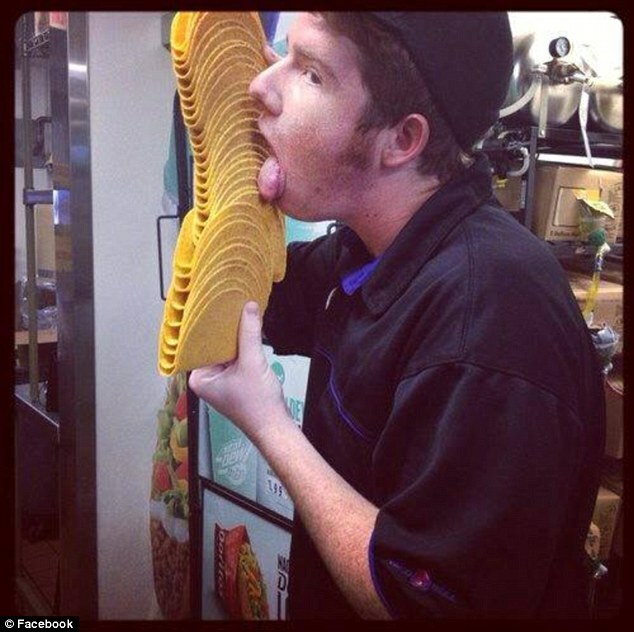 Now that some time has passed this ‘taco licking incident’ appears as just another blip on the social media scene. During the same week a post about a man on a train supposedly bragging about his extramarital affairs and outed by a passenger was hogging up the indignant outrage. I won’t share that link because again, no one knew the facts as it gained on 100,000 Facebook shares last Friday. But the point is: we’ll all forget about the Taco Licker in a few weeks. Taco Bell’s measured silence was probably the right one. Although he is criticized for his brash demeanor, American Apparel CEO Don Charney was probably right when he decided that responding to social criticism may not always be the right move. His handling of the criticism he received over the #Sandy hashtag to promote a sale when the northeast was being slammed with a massive storm was met with an enormous online backlash, but that didn’t translate to lost sales. We covered the fact that American Apparel sales went up during the outrage in a post a few weeks ago. Although more silently, Taco Bell appears to be taking the same approach, and I think it’s smart. Yes, I would have made the official post easier to find on their website, but their patient and repeated handling of questioning on their Facebook Page gets them an A in my book. Like American Apparel, Taco Bell appears to have a passionate and loyal following. Tomorrow we’ll start the new week, and you can bet that our memory of the Taco Bell Licker will recede, and within a matter of weeks or even days, we’ll be on about some other immature ‘prankster’ pulling a similar trick. And yes, we’ll be following up on the impact this ‘crisis’ has on Taco Bell down the road. Makes you think we may need to invent a new word for these dust ups, because the word crisis may be a bit too strong to be used on a weekly basis. Stupid? Probably, but lately I’ve been thinking about two other, larger issues. 1) By all accounts this seems like an employee joking around after a training. We all joke. Yes, this joke could cost him his job and could hurt the company reputation, but are we losing our ability to laugh at ourselves? Are we losing our ability to be playful? Not defending this situation, but thinking in bigger picture terms. 2) We are ripe for business sabotage. The situation is such that anyone could post any picture: real, posed, photoshopped, and the damage will be done. It’s too easy. I know because I’ve been victim of a bit of this myself lately and it has damaged friendships (and worse), even though it was all done behind the scenes and not publicly. This underlines the need for a few things, including digital training for ALL employees, a strong digital social media policy for ALL employees, that has “teeth” and isn’t just a page with words, and having a crisis plan in place. In other words, this is a whole new world. The rules are changing, which is, in turn, changing our culture; our ethos. KenMueller Yes, some of my friends that I happen to work with think I have no sense of humor on the subject, but I really think that this goes beyond a prank. It’s one thing if you’re joking around in a plumbing shop, but this company’s business is FOOD. How would you feel if you ate those tacos? I wouldn’t find it funny. And yes, you are right as far as the need for more clear communication to employees about what is and isn’t allowed. I haven’t eaten there in decades. If the wrapper costs more than the food that’s in it, how can it be good? It’s gross but we’ve raised ourselves (generally speaking) a generation or so of kids who mostly don’t give a cr*p about anything. This is why they walk into schools and shoot each other. It’s got to be the loneliest and disconnected generation of kids we’ve had yet. @Rose Brown You know what’s interesting about that Rose, they’re known as the ‘connected generation.’ You now have me thinking about a post called the Connected/Disconnected generation. You raise a good question, AmyMccTobin: what is appropriate punishment? This kid’s ‘prank’ has real business costs for his employer. If he stole an equivalent amount of food or money from the company, it would be considered a crime. If his ‘prank’ had directly impacted a Taco Bell customer, the company would have been held accountable for the young man’s actions and forced to compensate the customer (the injured party). And yet when the injured party is the company, no one seems to think the responsible party (the young man) should be held accountable. I think we tend to have less sympathy when we’re dealing with large companies. Can you imagine how the exact same scenario would have impacted a small business? I think there should be financial consequences for his actions. If he had a sizable fine, especially one which took him a year or two to pay off, two things would be accomplished: (1) the young man might learn to appreciate the value of having a job (especially when so many do not and would gladly take his) and (2) the message would be sent out that there are real costs and consequences to such a ‘prank’ – maybe we’d see less of them. acjandler AmyMccTobin Thank goodness there is another smart person out there who agrees with me!!! And your point about the effect this could have on a small business is a fine one that I should have made myself. We have talked many times on the Social Justice series about the double standards brands vs. people are held to, but what seems to be missed here is that companies are made up of people. If the company, or even a franchise is hurt and sales slump, PEOPLE lose their jobs… and they’re usually the people at the bottom of the totem pole. I am with you 100%, and thanks for coming by! That’s an interesting point you raise, Rose. Where would you say we can improve – does our “always on” mindset to work now mean there’s less quality time spent with the family, so we neglect our kids and dump them in front of the TV/computer when they’re home so we can work on that last report? Or is there something else, outwith the parent fold? bowden2bowden Thx for the share Randy! Tweet4OK NewMemeMedia BrandConnection THx for sharing the Taco Bell post! AmyMccTobin that was quite something …. vewry interesting post thanks! AmyMccTobin Thank you Amy – I hadn’t! hessiejones interacter Why thanks Neal! Really thought your comment was insightful. I don’t know what captured my interest the most in the post: (1) The big Cow Lick picture, or (2) Amy thinking she has even “mediocre” patience. As for Taco Bell…I wish I would have had a Pulse Analytics data collection on them when it happened. It would have been fun to see WHAT social networks lit up…as well as reviews on Yelp/TripAdvisor, blogs, etc. Do you think it would have been too cavalier for them to “spoof” the picture? They could have shared it themselves with a message like “our food is SOOOO good, that we introduced the Lick Test as part of the interview process for all employees. If they can’t go 5 minutes without losing control….like this unfortunate fella who failed spectacularly…then perhaps they should go work for one of our less tasty competitors”. Danny Brown dbvickery hessiej and me! AmyMccTobin Danny Brown dbvickery hessiej Yup!! hessiej AmyMccTobin Danny Brown I’ve been a Pulse Analytics demo fiend this week. Take a look at your schedules for next week, and let’s make it happen. I’ll probably send a GoToMeeting invite because G+ Hangouts do not maximize the shared screen unless you are doing Hangouts On Air…and I assume we want this one a private affair vs recording our typical antics. dbvickery hessiej AmyMccTobin Danny Brown My Tuesday’s booked solid – Danny we have that one call scheduled, but otherwise I’m free. It’s Mr. Big time you need to coordinate with Brian. AmyMccTobin dbvickery hessiej Next Wednesday between 10am and 11.30am EST is good, or Friday of next week. Danny Brown AmyMccTobin dbvickery hessiej I’m good for both of those times. I’ll send a GoToMeeting invite to Danny since I have his email…he can forward to the rest of the gang…or FB message / Twitter DM me your email address. dbvickery Ha Ha Ha. You made me laugh out loud on a day I wasn’t laughing much. So glad you’re back from slacking off. Yes, I think brands deserve to have a sense of humor, although I think they did a pretty decent job… it’s already fading from memory. Having worked for a fast food franchise in my youth, I think that it was not wrong for the individual to be fired. I don’t think that community service would necessarily be required as additional punishment. That guy is going to be known as the Taco Bell guy for a while. I hope that is sends a message to all teenage fast food employees and teenagers in general that nothing on the Internet is private and it can live forever. So before you take that picture and post it, think about the potential consequences. In this particular case, the shells may have been slated for disposal but that fact did not come out til it was too late and frankly didn’t really matter. The damage was done and the prank was taken to be a sign of a health risk and for that reason alone I don’t take issue with the kid being fired. I also want to add that this will likely be a lesson to franchisors and franchisees to figure a crisis management plan or at least start incorporating it into the agreement and onboarding process because the speed at which organizations can respond will be dependent on their level of preparedness. Nobody wants to be in these types of situations but the franchise model is a distributed business model with no real internal direct lines of communication between franchisor and franchisee in the same way there is within a corporation with regional offices. Perhaps they will need to consider some type of red phone that they just pick up and it connects them to the right person.